Major General Chia-Jen Chu (1900 – 1985) was a graduate of the MIT Class of 1926. After completing his engineering education in the United States of America (USA) and a year of internship in the American aviation industry, Chia-Jen Chu went back to China to join the newly established Republic of China Air Force (RoCAF). 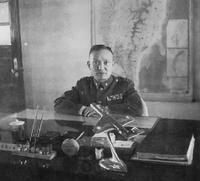 During the Eight Year’s War of Resistance (1937-1945) and WWII, Major General C.J. Chu designed the first Chinese trainer (Suzhou, in May 1937) and helicopter (the CJC-1A Hummingbird Model A, in 1945). On December 31, 1962, Maj Gen Chu Chu retired from the RoCAF after 34 ½ years of service to his country. Source: Virasak, Jacques. "The First Chinese Tandem Helicopter Designed by Major General Chia-Jen Chu of RoCAF". Published by AHS International History Committee. Page 1.